Oct 1-7 is Mental Illness Awareness Week (MIAW), an annual national public education campaign coordinated by the Canadian Alliance on Mental Illness and Mental Health (CAMIMH). CAMIMH’s mandate is to ensure that mental illness and mental health are placed on the national agenda so that Canadians receive appropriate access to care and support. 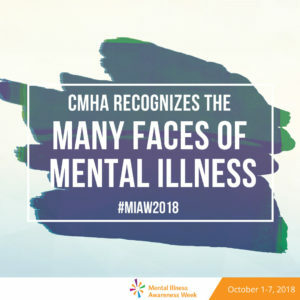 CMHA is an active member of CAMIMH and is proud to support its annual Faces of Mental Illness campaign during MIAW. For more information on mental health services in your community, visit your local CMHA branch.